WASHINGTON, DC, August 22, 2013 (ENS) – A dam that has blocked Maryland’s Patapsco River for nearly 100 years will be removed shortly, utilizing a $3.57 million grant awarded by the National Oceanic and Atmospheric Administration’s Restoration Center to the nonprofit organization American Rivers. The grant supports the Patapsco River Restoration Project. It will fund removal of the Bloede Dam, the lowermost dam on the river, opening up more than 44 miles of spawning habitat for blueback herring, alewife and American shad, and more than 180 miles of habitat for American eel. Herring and shad are critical to the web of life in the Patapsco River and the Chesapeake Bay, and are an important food source for other recreational and commercial fish species like striped bass, says the river advocacy group. “Removing one dam can make a major difference in the health of a river and its fisheries. But removing multiple dams, as we’re doing on the Patapsco, is really a game-changer when it comes to improving the overall health of the river and boosting the long-term recovery of migratory fish,” said Serena McClain, director of river restoration at American Rivers. “We are seeing great success on rivers like the Kennebec in Maine and Town Brook in Massachusetts where multiple dams were removed, and we are excited to watch the progress on the Patapsco,” said McClain. McClain calls the Patapsco “one of the Baltimore area’s hidden jewels,” for fishing, hiking, paddling, tubing and just taking a break from the summer heat. American Rivers, the Maryland Department of Natural Resources, the National Oceanic and Atmospheric Administration, and the Friends of the Patapsco Valley State Park have worked together for more than five years to restore the Patapsco River. Removal of the Union Dam was completed in September 2010, followed by the removal of the Simkins Dam in March 2011. 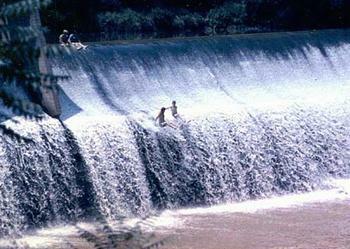 The Bloede Dam was built in 1907 as the world’s first underwater hydroelectric plant. It is named after Victor Gustav Bloede, then president of the Patapsco Electric and Manufacturing of Ellicott City. Today the dam is located within the Patapsco River State Park and is owned by the Maryland Department of Natural Resources. Removal of the Bloede Dam will leave the Daniels Dam as the last remaining dam along the main branch of the Patapsco River. The dam removal will eliminate a public safety hazard. Swimmers have died in the hazardous currents below the dam, including one person who died earlier this month. “The Maryland Department of Natural Resources whole-heartedly supports the dam’s removal, which reduces the safety hazard long posed by the site and improves the Patapsco’s fishery,” said Secretary Joe Gill, Maryland Department of Natural Resources. American Rivers points to the hundreds of thousands of dams blocking rivers across the United States, many of them obsolete, unsafe, or abandoned. Removing outdated dams can bring multiple benefits to communities, the group says. More than 1,100 dams have been removed across the country over the past 100 years. 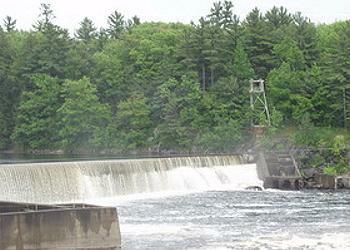 Another current project is the removal of Veazie Dam from Maine’s Penobscot River that began in late July. This removal will reconnect the river to the Gulf of Maine for the first time in nearly 200 years. Breaching this dam, which is the dam closest to the sea, is the next step in a larger effort to improve access to nearly 1,000 miles of river habitat on the river. Last summer, the NOAA Restoration Center and its contractors removed the Great Works Dam on the Penobscot River; additional fish passage improvements at dams in the upper Penobscot watershed could start next year. These measures will improve access to spawning, rearing, and nursery habitat for endangered Atlantic salmon, American shad, and river herring, the Restoration Center says. Once the dams are removed, endangered shortnose sturgeon, threatened Atlantic sturgeon, striped bass, and other fish will be able to access 100 percent of their historic habitat. The dam removal project is part of collaboration between the Penobscot River Restoration Trust, NOAA and other federal and state agencies, the Penobscot Indian Nation, and seven conservation groups.